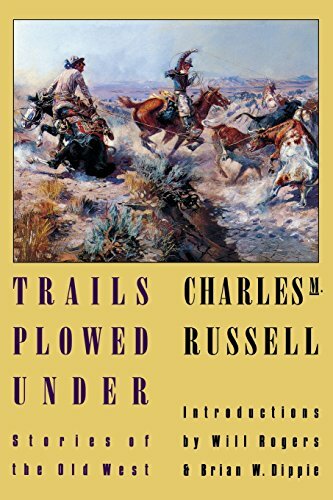 Born during the Civil War when America was on the brink of modernity, Charles Marion Russell used his art to record the fading days of the Old West, its land and people. 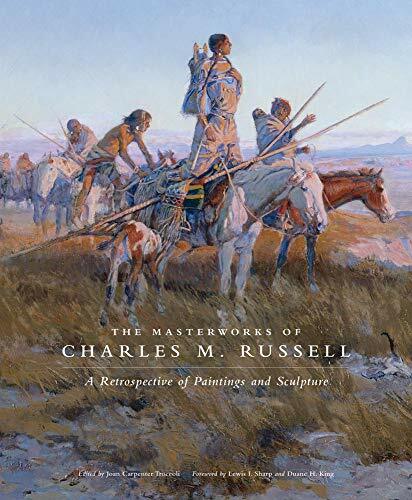 Not only was Russell a fine artist and sculptor, but he used his art to draw attention to the land and culture of Native Americans which was under attack from the US Government’s ever-growing expansion into their territories. His concerns extended to the buffalo which was also coming under threat for the same reasons. He was, in this respect, one of the earliest environmentalists. Charles Marion Russell was born on March 19th 1864 near St Louis, Missouri. His family owed its prosperity to the brick-making and coalmining industries. At home Charley heard tales about the fur trade, trappers, and encounters with Native American Indians. From an early age Charley played truant from school, becoming obsessed with going West. Despite attending military school he failed to straighten out. 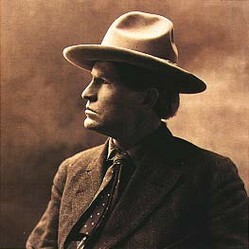 Aged fifteen, his parents sent him West to Montana to work on a sheep ranch. They hoped the reality of hard work would force him to conform. Charley did not take to sheep and was sacked. Instead he teamed up with a trapper, Jake Hoover. For two years Charley Russell lived with Jake in his log cabin. No doubt skinning and butchering contributed to the developing artist’s anatomical knowledge of animals. The buffalo would become Charley’s greatest icon. He revered it, railing against its devastation and using its skull as a trademark on his letters. He was a conservationist before it was fashionable, never hunting for sport alone and respecting the wilderness. In 1882 Charley experienced the lonely cowboy life as a night herder of cattle. He kept this job for eleven years, using the daytime hours to observe other cowboys and draw the reality of their lives. H e became a great storyteller, illustrating his tales with deftly made beeswax figurines. From these humble beginnings he would eventually develop his bronze sculptures. During the bitter winter of 1886 Charley and another cowboy were sitting in the bunkhouse in Utica. Charley's cowboy pal was trying to write a letter to a friend, describing the terrible weather conditions they were experiencing and the devastating effects it was having on the life around them. The cowboy was struggling to put it all into words, so Charley drew him a picture of a dying cow surrounded by wolves, entitled Waiting for a Chinook. The recipient received the picture but without an accompanying letter. There was no need for words. Charley's painting said it all. The man owned a store and he displayed it in his window in Helena where it attracted a great deal of attention. "...a moist warm wind blowing from the sea in coastal regions of the Pacific Northwest....A warm dry wind that descends from the eastern slopes of the Rocky Mountains, causing a rapid rise in temperature." Charley had a deep interest in Native American culture. In the winter of 1888 he stayed in Canada with the Blood Indians of Alberta, kin of the Blackfoot confederacy. 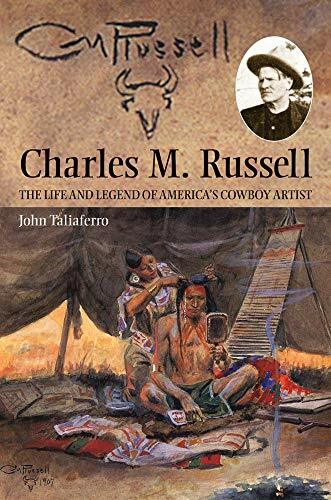 He painted buffalo hunts and scenes of daily life, ensuring every detail was anthropologically correct, even down to the beadwork on clothing. He recognised the dignity of Plains Indian women, admiring their resourcefulness. The Blood Indians gave Charley the name Ah-wah-cous, or Antelope. In 1893 Charley moved to Great Falls where he lived a sparse life selling his work. He painted the nearby landscape of Cascade and it was here that he met his future wife, Nancy. Just 17, and bright as a button, she was living with a family, helping out with the chores. A year later they were married and Nancy became Charley’s business manager. Nancy had a good head for business. She could 'think outside the box' and on visits to New York she persuaded galleries and collectors to buy Charley’s work. As a result of her efforts, he gained commissions from the likes of The New York Times. Back in Great Falls, Montana they moved to a better neighbourhood and Nancy had a log studio built in the garden where Charley could paint in solitude. After twenty years of childlessness they adopted a boy, Jack. Charley's talents were recognised and he became in great demand. Theodore Roosevelt bought a bronze sculpture and movie stars collected his work. 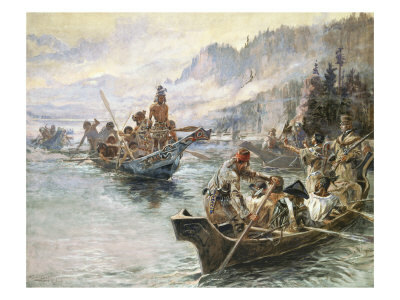 The Montana legislature commissioned Charley to paint a huge mural in the State Capitol showing Lewis and Clark’s historic meeting with the Flathead Indians. 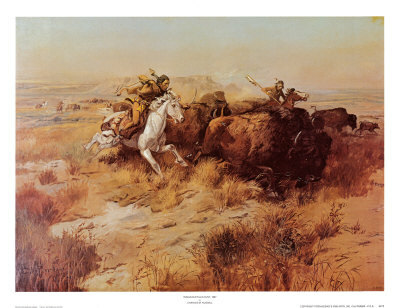 Charley ensured that the Flathead Indians took a prominant place in this mural, as he did in the dramatic picture below. Charley died of a heart attack on October 24, 1926 at the age of 62. 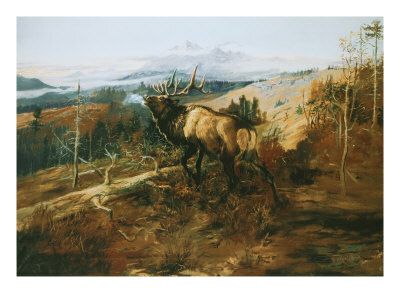 He lies on a hilltop overlooking the Montana landscape he so lovingly captured on canvas. His work is a window onto a world now sadly long gone. But his central message of concern and love for the environment and its people is extremely relevant today. A compelling portrait of a man in women's clothing has been purchased by the National Portrait Gallery, London.